We land in Amsterdam and Ford meets us with a brand new Fiesta ST as we start our trip to the Nürburgring 24 and Monaco, but it's at a random bar we get a message about the wildest racing we might see: The Dïrtburgring. 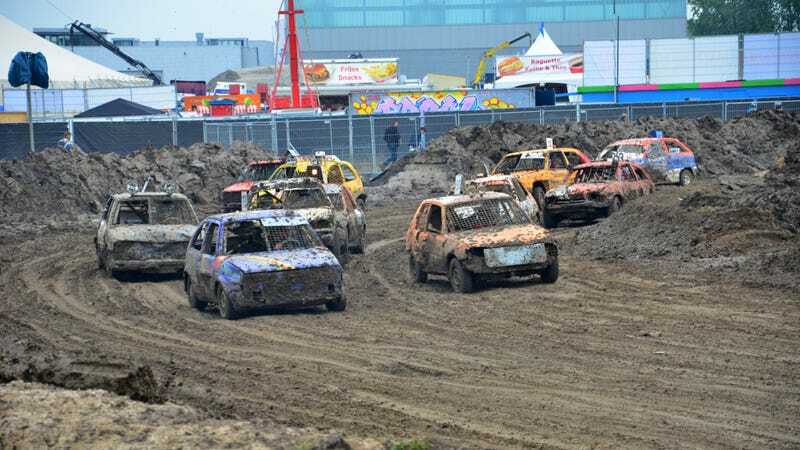 Imagine 24 Hours of LeMons meets Sprint Cars meets Destruction Derby. Europe, you so crazy. The Fiesta, btw, is awesome! Yes they gave it me borrow it for our motorsport road trip but the car is seriously cool. If only you could rent cars like this in Europe. It's small but perfectly fast for our purposes and it gets good gas mileage. Even at 126mph – more on this later. Or you can park it on the sidewalk or crash it into the side of building and run! We drive into Amsterdam and park the car for 36hrs of partying before leaving for the 24hrs of the Nürburgring. We did some proper cultural stuff, too, like visit the Van Gogh Museum which is really cool. One of my favorites by far. I know it's not car related but its seriously a cool place. I even doctored up some of his work using Instagram. Yeah it looks like the Simpsons... welcome to Amsterdam. Next up is T Arendsnest, a really cool bar specializing in Dutch beer. I like beer, but a bar that specializes in beer is always a cool place. With the car responsibly parked for the night it gave us a chance to check out this draft list! The real surprise was the liquor made from Jenever and aged 5 years like whiskey. Our night got interesting quick. But man is Amsterdam amazing at night! Things started out very casual. Then we realized we had a lot to drink. We moved to Gollem because it seemed like the right thing to do. Both these bars love their beer and so did we love them! We wake up to a Facebook message from my friend Klaas who says he's racing an hour away from Amsterdam. So why not? Welcome to what I now call THE DIRTBURGRING! It has a proper name called FouteCross but to me it looked like LeMons on dirt! It was amazing. I even paid 15 Euro to go in an watch. I thought this was really cool. Teams were taking snow tires and cutting them like madmen to create dirt or really mud racing tires. This could never happen in the U.S. I was told the minimum age to race was 12 years old! This kid would be denied numerous rides at Disneyland because of his height...but not in the Netherlands... this kid races full size cars! SO AWESOME! Also take a look at the cardboard center of the steering wheel. I think this is to prevent you from locking your thumbs into the wheel and loosing them when you hit a rut or get hit by another car. I can also tell you that the Fiesta ST works well in the dirt too BTW. Nice having the coolest car in the parking lot! I have no idea what these are but they look like homemade sprint cars!!!!!! Even in Europe the E30 is the king of cheap endurance racing! But most of the cars looked like this! Fully A Team'd out with cages for windshields! There were some pretty unusual cars too...at least for Europe! Or at least I thought so! Check out this roll cage! Not everything in Europe is FIA certified. It looks like some industrial support system fitted to the car. It doesn't even cover the full width of the cockpit. But its really doubtful something will collapse this system given its size! It's hard to describe the amount of mud going on, which is why I named this place the Dïrtburgring. We finally rolled out at 3pm and drove 3 hours to proper Nürburgring! The race starts tomorrow at 5pm so we have a fun saturday night ahead of us. And we wanted to grab dinner at Pistenklause so we made some time...LEGALLY! Next update will be Saturday night at Pistenklause with fellow Jalops Torben and Hemmerle! Also will explain how to convert your spare tire wheel in the Fiesta to an ice chest to cool your super awesome German Beer while posting to Jalopnik from the bar!